We are happy to share a blog post written by Mike Price. Here, Mike describes xeriscape (zer-i-skape) gardening, a method of gardening that reduces water and energy use. Climate change is resulting in hotter and drier summers, which means we need to consider new water-efficient ways to maintain our gardens. Not only did Mike Price write this blog, he also shared a great photo of his water-efficient garden! Designing landscapes that match local conditions with xeric (or water-wise) plants, trees and shrubs that will thrive. Xeriscaping literally means dry gardening and was invented in Colorado in the 1980’s. Do you have to re-engineer your whole garden to switch to this “xeriscaping”? No you don’t. You can change part of it. Maybe you have a problem area where your present maintenance isn’t working well. Maybe you have an area that isn’t very attractive in its present state. 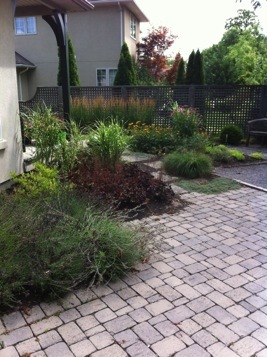 Eventually you may want to change your whole yard to an Eco-garden, but you can do it a section at a time. If areas are to be paved for recreation purposes then open joints allow for rain-water to soak into the ground rather than running off the property. The best way to plan the change is to check with your local nursery, or check in a book or on the internet to find which plants are drought-tolerant, then move the plants that need regular, frequent watering to another part of your garden and replace them in your new dry land area with new plants known to be drought-tolerant. This is not rocket science. It’s the old learning curve: steeper at first, easier later. Most plants are quite adaptable and give you lots of warning when all is not well with them. And gardens are often somewhat of a “work-in-progress”. Plants die, get too big, don’t do what you thought they would, or would look better in some other part of the garden. But if you move plants around too often, sticking them here, then there, it’s known as ‘velcro-gardening’! If you are going to try xeriscap gardening, you do need to know a bit more about plants and soils than the “water every few days” that is adequate when you have loads of rain-water. There are seven principles of xeriscape gardening. Check out the details at the Toronto Water website. By following these seven basic principles when xeriscaping your lawn and garden, you can create a lush, colourful and unique garden that requires less maintenance and water – leaving you to sit back and enjoy your summer. Or travel without worrying about who will water what! For a complete list of suitable plants that are readily available, visit your local garden centre or look on websites such as the Urban Farmer. 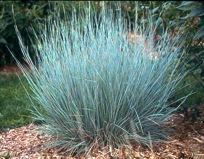 It is a safe bet when looking for drought tolerant plants to pick ones with grey or bluish foliage, usually a sign that they can take the heat and need little water. 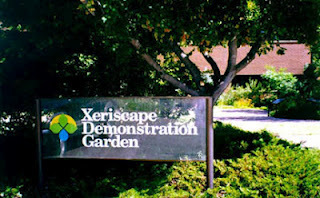 Attributes of good Xeriscape education gardens include labels for plant materials, other interpretive materials such as brochures and plant lists, grouping of plant by similar water needs, ease of public access including ADA standards and availability of knowledgeable persons to explain the garden to visitors. Feedback from visitors to the garden owners or managers should be encouraged. As a real ‘alternative’ garden concept one could even consider “hugelkultur” instead of irrigation!